Rajasthan in western India is well known for, amongst other things, block printed fabrics. 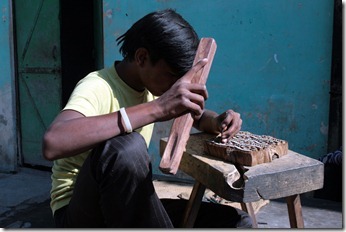 In my research for fair trade goods, I had found a small organisation in a village outside Jaipur, where the artisans are paid very well. I made contact with them before I left Australia and was very eager to meet the block carvers, dyers and printers and see their work. Getting to Bagru village was a bit of a drama, but so worth it in the end. I had made enquiries about local buses that would take me there from Jaipur, but I had managed to get to the wrong bus stop and wasted some time for a bus that would never some. With the help of locals, I found the right stop, but every bus that came by was full to overflowing with passengers hanging out the doors. So it was in a rickety and uncomfortable autorick that I eventually arrived in the village several hours later. There was no mistaking that this is a printing village: colourful lengths of fabric hang from buildings, drying in the sun. Bagru is known for natural dyes and hand block printing . The three-centuries-old tradition of block printing is kept alive with the efforts of Bagru artisans. Chippa Mohalla (printer’s quarter) is the area where people are always engrossed with dyes and blocks. 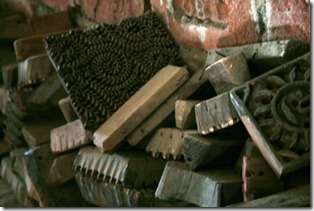 The three-centuries-old tradition of block printing is kept alive with the efforts of Bagru artisans. Keeping the convention, these artisans smear the cloth with Fuller’s earth from the riverside and then dip it in turmeric water to get the habitual cream color background. After that, they stamp the cloth with hand carved wooden blocks using natural dyes. Artisans use traditional vegetable dyes for printing the cloth: blue from indigo, greens from indigo mixed with pomegranate, red from madder root and yellow from turmeric. Walking through the streets, I met the block carvers sitting in the winter sunshine carving chunks of wood into delicate printing blocks; saw the indigo dyers plunging cloth into deep dye pits, and women carrying great lengths of fabric to dry laid out on the ground. I met printers in their home workshops creating beautiful textiles with a combination of block and discharge printing. The block printed bedcovers I bought were all made by husband and wife team, Chandra Prakash and Reshma Devi. They have a keen sense of design and colour and make all their textiles in their house and dry them in the courtyard. Their designs created from multiple intricately carved wood blocks and layers of colour.